Whatever the flop is and whatever your position is; you need to defend your strong hand. The amount of your continuation bet depends on many factors, such as the number of opponents and the texture of the flop, anyway you’ll make a bet between half size of the pot [which can give you a good chance of winning the pot, creating favorable odds for yourself (it only requires you to win one time in three to break even)] and the whole amount of the pot. Obviously hitting the third Ace represents a great advantage for you (you have odds to hit a set or better 7.5:1), but at the same time many beginners commit a huge mistake: applying the Slowplay. Even if your hand now seems much stronger, it can be beaten by probable flushes or straights (but this depends by the texture of the flop); so, in this case too, you have to make your continuation bet. If the flop isn’t scary, you could play in a different way: Making a “Donk Bet”, which in this case represents a kind of trapping. The “Donk Bet” is a move that works well against aggressive players, and it works better if you are the first to act; it consists in betting the minimum you can (or a small part of the pot) making the players on your right guess you have a weak hand and you want to get the pot cheaply, they will probably raise you, and your trap is done. This move certainly has to be avoided in case of a flop which could include straight or flush draws, cause this kind of bet gives great pot odds to any opponent. It also works better if you know the style of playing of every opponent. “Falling in love” with the pocket aces is a very common situation for low-medium skilled players, and it’s one of the most common (and hugest) mistakes in this game. “Falling in love” means decide to play this hand every board, slowplaying, check-calling passively the opponents’ bets; playing this way, you’ll probably lose lots of your chips. 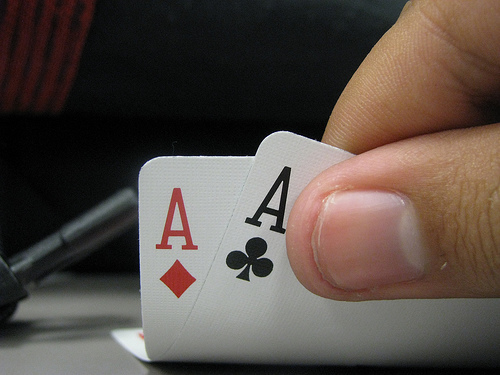 Although the Pocket Aces is the best starting hand, we should be able to fold our hand on a board which is particularly scary. Q-Q-x or J-J-x and here we have obviously been aware of possible trips. Cards of the playing zone such as K-Q-x or Q-J-x: we have been aware of a double pair and a straight draw. Low connectors (if they’re suited your situation is worse), such as 8-9-x or 6-7-x.